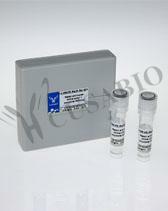 Secondary antibodies are generated by immunizing a host animal with an antibody from a different species. Goat, donkey, sheep, chicken and rabbit are the most commonly used host species for raising secondary antibodies, though others are available. CUSABIO secondary antibody offer increased sensitivity through the signal amplification that occurs as multiple secondary antibodies bind to a single primary antibody. CUSABIO secondary antibody can be used with any primary antibody of the same isotype and target species, making it a more versatile reagent than individually labeled primary antibodies.